I am grateful to Ramapriya for allowing me to share her poem here. 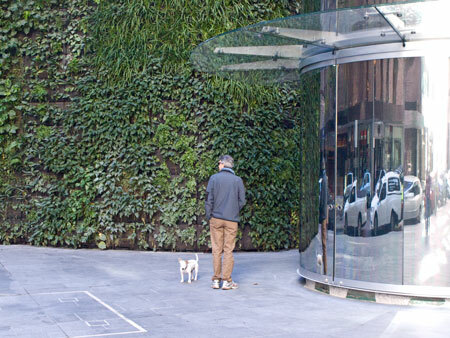 A few weeks ago we went to the CBD to see a green wall. 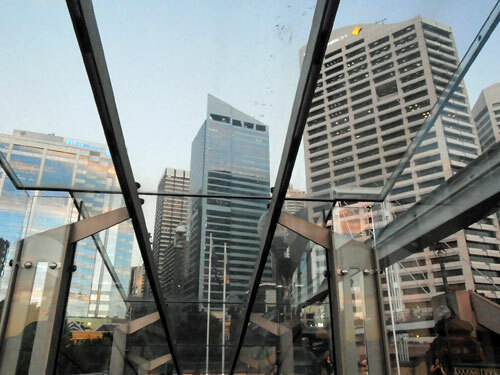 It is at the new 29 storey, 43,419 square metre Cbus tower at 1 Bligh Street Sydney. The wall was receiving the finishing touches when we visited so I was lucky enough to have aspects of the wall & how it is managed explained to me by the builders. They were very proud of their work & deservedly so. 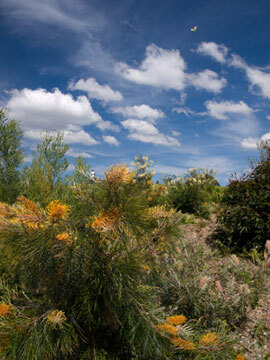 The living green wall is likely the best & largest that we have in Australia at present. I haven’t seen anything like this before. It is stunning to say the least & once fully-grown will be even better. I predict this green wall will be a tourist attraction at least until green walls become the norm. I hope that time arrives soon because the benefits are great. The wall itself is 9.7-metres high & 40-metres long. It is watered by black water generated from the Cbus tower & has a system of pumps incorporated into small cupboard rooms hidden as part of the wall. The doors are almost invisible once they are closed. I guess there will be subtle clues as to where the handles & keyholes will be, but unless you knew there are doors here, you wouldn’t know. The plants are wild tropical water-loving plants. They are planted into boxes made up of geo-textile & filled with exceptionally light potting mix & polystyrene balls. 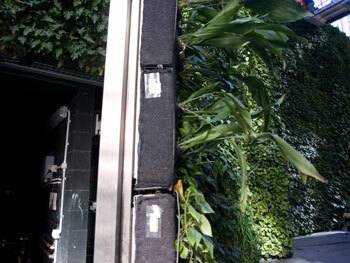 These boxes are fixed to the wall & the plants planted into small cuts into the material. They naturally grow roots inside the potting material & some also on the exterior of the geo-textile itself. Apart from being very beautiful to look at, the air around the green wall is cool & likely full of negative ions. It has been made into a place where one can get the benefits of being in a park with running water while being in the busy CBD. It’s a great area to eat lunch. I was surprised to see a couple of butterflies flitting around exploring. Somehow insects know. The north-facing building has a double-glazed all-glass façade, thereby utilizing natural light. Inside the double skins are adjustable horizontal blinds that work by automatically shading the internal skin & preventing solar heat gain & keep the building cool. The 2.85-metre ceiling height of each level also promotes natural airflow. An artistic aluminum curtain protects the building from the western sun. 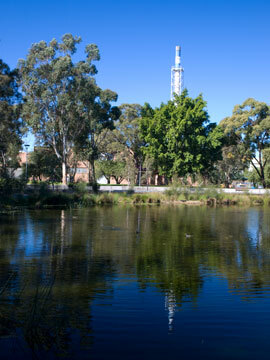 All water used in the tower will be recycled for use elsewhere on the property. Recycled black water is used for toilets. If needed, they can tap into the city’s black water supplies. The green wall & other landscaping features are watered by collected rainwater. The building will be heated by a tri-generation system using gas for cooling, heating & electricity as well as solar panels. The atrium is the tallest in Australia & reaches the full height of the building (29 storeys) bringing fresh air to the upper levels. There is an internal ‘winter garden,’ plus an external 375-square metre terrace. A 700-square metre ‘sky garden’ crowns the building. The sky garden is shielded from the wind by a 10-metre glass wall. There are also numerous living internal landscaping features throughout the building. Apart from the usual underground parking for cars, there is also covered parking for 300 bicycles. What a building! Hopefully this will become the norm. It is a mighty achievement for sustainability & creating the least possible impact on the environment. It also shows what is possible & how we can change the way we build & manage buildings. I love it & can’t wait until I have an opportunity to go inside. 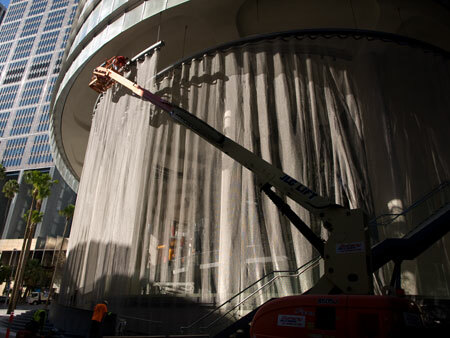 The aluminium curtain at the Cbus tower. It does not move, even though it looks like it should. The curtain lets light & air in, but keeps the heat of the sun out. I think it's beautiful. How it looks would change throughout the day adding interest & more beauty. Mature palm trees can be seen in the background. These are new & are outside the main entrance. Today is World Environment Day. 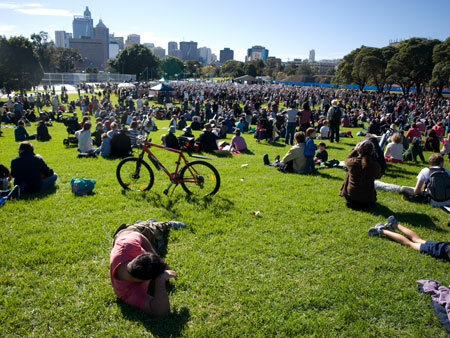 Sydney put on a beautiful sunny winter’s day for the 8,000 people who attended the Say “Yes” to Climate Action Rally in Prince Alfred Park Sydney today. Even as speeches were ending, hundreds of people were still arriving walking from Central Railway Station. The crowd was made up of young & old. Promoted as a family-friendly day out, there were also many babies & young children. Two young people were the main speakers. They both gave great, impassioned speeches about the threat of climate change to Australia, the world, their future & the future of their own children & grandchildren. The crowd also sung happy birthday to a 92-year-old woman who said we must do something now to tackle global warming. The mood of the crowd was very peaceful, accommodating, friendly & resolute – action about climate change needs to happen immediately. 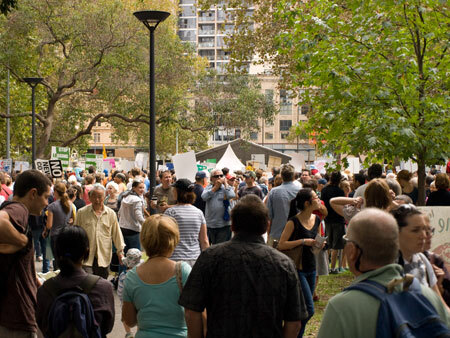 Today I learnt that there were 2 climate rallies happening in Sydney today, one supporting a price on carbon at Belmore Park & another against the Carbon Tax at Hyde Park. 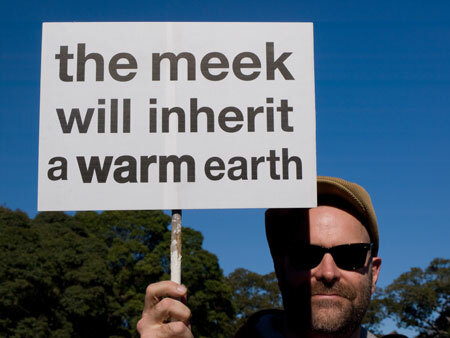 We went to the Belmore Park Rally. Leaving Central Railway Station at 11am was like being caught up in a sea of people walking to Belmore Park. 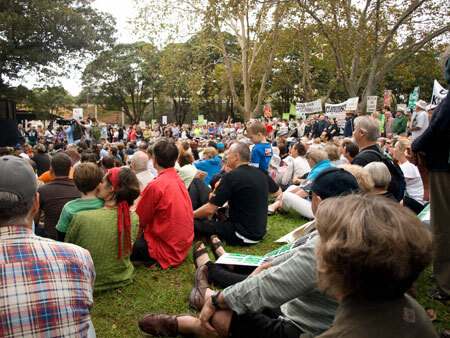 Official estimates say that 8,000 people attended the Belmore Park Rally. I believe this because the park was packed with people of all ages. The speeches were good, so was the mood of the people. One speaker said something like, “This is the last generation that can do something to stop runaway climate change.” Words like this always seem surreal to me because the idea that Planet Earth can reach a point where it won’t support human life makes me think of the unspeakable suffering necessary on the journey to reach this point. To me it seems stupid to ignore the climate scientists. I’d love it if they were wrong. Everyone would. 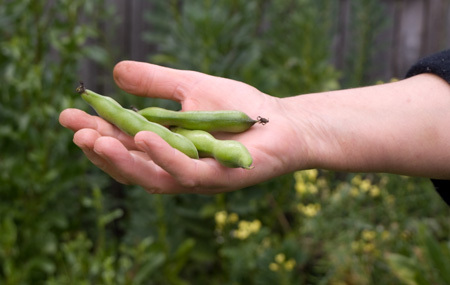 This is absolutely not about trees, but it is about the environment & stopping good food from going to landfill. Tonight a young man slipped a small piece of paper into my hand. I asked what it was about & he said, “I’m trying to feed 50,000 people.” Boy, that got my attention. His name Stan Ghys & his story goes like this. He won the People’s Choice Award in an art competition with an artwork made from 50,000 bottle tops. He donated his prize money to OzHarvest & decided to keep going with fundraising. His first step is to raise $15,000 & donations are tax deductible. We discovered this park a couple of months ago & what a discovery it was. 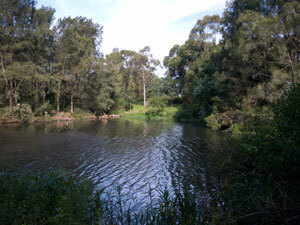 If you are into nature, a bit of bush, water, birds & walking, this is a great place for a wander. The sign says it was opened for the bicentenary in 1988. The park is divided into 3 sections known as North, South & East. This post is about East & North Bicentennial Park. 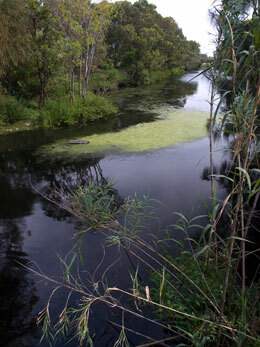 We have yet to visit South Bicentennial Park, which looks more of a wild park as it’s part of wetlands. It’s a big place that joins with Scarborough Park, which has its own North, East, South & Central. Scarborough Park Central is more like a regular park with playing fields & a skate park filled with talented kids. If you wander through the playing fields to the bank of trees, you find yourself entering a bush area filled with trees. Many of the trees are quite substantial in girth & height & must be a few decades old. A ring of moving water does an oval journey around a couple of islands before it travels to a wetland lake in South Bicentennial Park on the other side of President Avenue. The islands are filled with natural bush & trees. 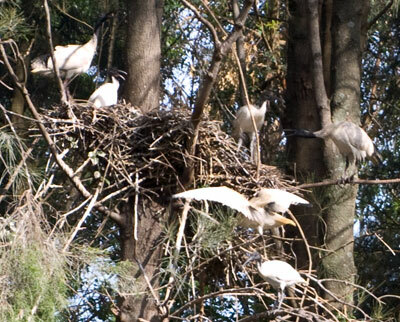 Many of the trees have Ibis nests high up in the branches with families of Ibis perching. It’s quite a sight. The sound from baby birds trilling, as only Ibis do, was lovely. There were also wild ducks & geese when we were there. The path around the islands & to the pedestrian bridge is a wide path of mown grass, no concrete anywhere, which feels like a luxury these days. 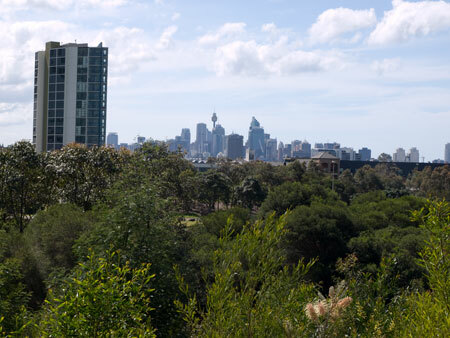 It’s safe with enough people with dogs walking around to know that someone would hear you if you needed help, yet you are far enough away from the traffic & the sight of buildings to feel you are anywhere other than in the Inner South East of Sydney. 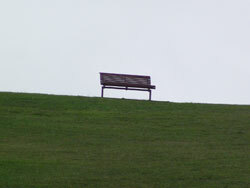 The terrain is mostly flat, suitable for a pram, but not a wheelchair. However, there is a car park near the water & a pedestrian bridge that is suitable for a wheelchair. It’s a fabulous place for a walk or a picnic as there are plenty of shady places to lay a blanket & watch the birds & other wildlife. 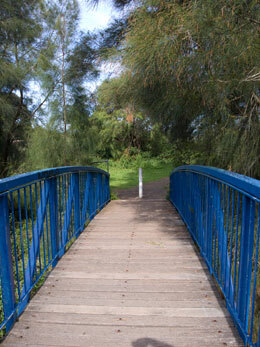 There are also plenty of places for the kids to have a run or explore. The skate park is part of Scarborough Park. When we were there it was filled with kids & I watched while they took turns allowing the little less experienced or younger children have a go before they did their runs & leaps into the air. 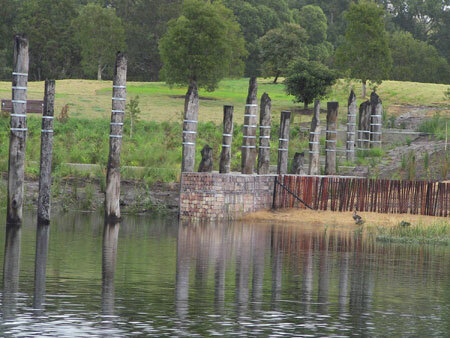 Rockdale Council has done a very great thing with this group of parks. 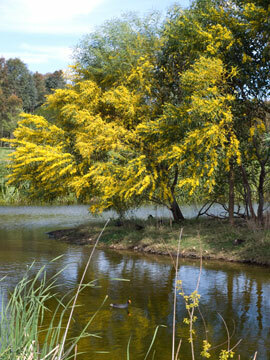 They have ensured that there is something for everyone whilst protecting areas purely for wildlife habitat. The map shows they have protected & worked on a significant wildlife corridor that is perfect habitat for water birds. I think they should be commended for this. In the past the area would have been drained, filled in & housing built on it or the park would have been made accessible for people from corner to corner with the wildlife having to make do. That this area has been made a wildlife sanctuary is a wonderful thing. We loved the place & will go again because there is a lot to see. In news just in, the Australian New Zealand Climate Forum is meeting in Hobart today. 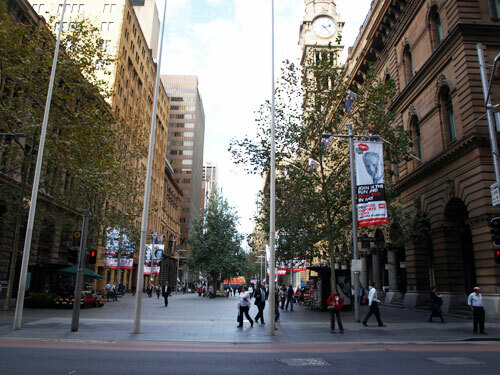 Climatologists have established that Australia’s cities are feeling the heat of both urbanisation & rising temperatures. Don’t stop at the Cockatoos, let’s shoot ALL birds! I don’t know what is happening to Sydney in regards to native wildlife. First we have the eviction of the flying-foxes from Sydney’s Botanical Gardens given to the go-ahead, now it seems that it’s okay as well to shoot Cockatoos in Broadway. 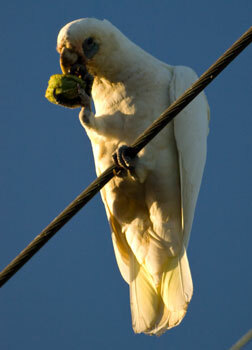 The National Parks & Wildlife Service have given permission for up to 20 Sulphur Crested cockatoos to be shot. Why? Well it’s because the birds are causing damage to the façade of the Sydney Campus Apartments in Broadway. I say, Shame on you National Parks & Wildlife Service. You should have said no. Shame on the owner of the Sydney Campus Apartments. If you change the material on the façade, this will stop. The birds aren’t eating the rest of the buildings all over Sydney.